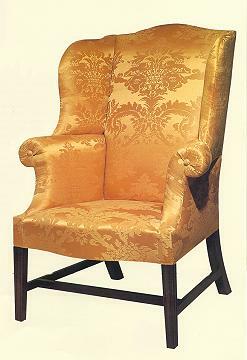 The "winged" easy chair was a popular form in England and America throughout the eighteenth century. Historical legend indicated that the wings provided protection from cold drafts and retained the heat from the fireplace, near which many easy chairs were placed. While the upholstered parts remained much the same through about 1810, the style of the legs changed according to prevailing fashion, and developments during the Federal period included a thinning of the wings and the use of horizontal rolled arms. Our American Federal ClassicsTM replica Philadelphia Hepplewhite wing chair is an exact copy of an original chair made in PPhiladelphia about 1790. The chair is transitional in style, with a serpentine crest and wings shaped from the sides. The rolled arms slope down into a serpentine front rail. The moulded, tapering legs are connected with stretchers, and the back legs rake out to provide a superb overall stance for this beautiful easy chair.